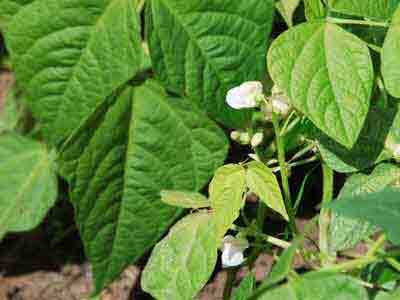 Bush beans are not very demanding and they flourish in almost any soil and can even be planted in partial shade. Your need: One person consumes an average of 2 kg a year. As they are not twining climbers, bush beans grow to a limited height of only 30 to 60 cm, so they don't need anything to climb up. They are especially easy to look after and promise a quick harvest. There are green stringless bush beans, an easy-pick variant with green pods which stay above the foliage and green snap beans, as well as yellow wax beans and blue bush beans. Bush beans are not very demanding. They flourish in almost any soil and can even be planted in partial shade. Propagate using harvested or bought seeds. Bush beans are very sensitive to frost. They should thus only be sown in late spring (in central Europe that means mid May) and should be covered with a fleece. To give the beans some more stability, the soil around the seed holes should be slightly heaped up. Diseases: Bacterial halo blight. The symptoms are yellow, oily spots. There is nothing that is effective. Cut off affected parts of the plant and destroy. Harvest time: Midsummer until early autumn, depending upon the variety and when it is sowed. Don't wait too long to harvest the beans as they otherwise become a little wooden and dry. Beans bind nitrogen into the soil, so their roots should remain in the soil after harvesting. Fresh bush beans will keep for about 3 to 5 days in your fridge's vegetable cooler, in a plastic bag which lets air through. They are also easy to freeze. Before freezing the beans briefly blanch them. Bush beans are only eaten when they have been cooked. They taste delicious wrapped in bacon, in a bean salad or as bean soup. One person consumes an average of 2 kg a year. Der Bohnenverbrauch laut der Bundesanstalt für Landwirtschaft und Ernährung (BLE) für das Jahr 2014 um 2,0 kg pro Kopf/Jahr. Die Buschbohnen bringen einen Ertrag von etwa 1,5 bis 2 kg pro Quadratmeter.